Tom Venuto’s “The Body Fat Solution”. The second part is card. Cardio burns calories pure and simple it doesn’t necessarily sculpt muscles. Cardio can be anything that gets the heart rate up and you burning calories. Some examples are running, boxing, karate and walking. Personally I walk between five to eight miles five days a week, train in Karate, hit the heavy bag and circuit train. The third part is Core exercises, learn the muscles that make up your Core. The Core is made of major muscles included are the pelvic floor muscles, transversus abdominis, multifidus, internal and external obliques, rectus abdominis, erector spinae (sacrospinalis) especially the longissimus thoracis, and the diaphragm. Minor core muscles include the latissimus dorsi, gluteus maximus, and trapezius. ( Source Wikipedia ) To summarize the previous all the muscles between your neck and your hips are your core muscles. The core is the major foundation for a strong body. It is a major factor in getting and maintaining a flat stomach or the much desired six pack. Personally this is the only time in my life I have ever seen my six pack. 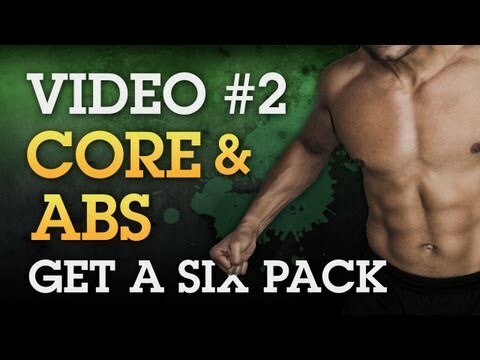 Core and Abs will be a series of videos that I will shoot on a continual basis. Each video will contain between 5 to 6 exercises that you can use in your regular workout or create a routine with. This video covers the 5 exercises that I use regularly combined within routines and within my own core workouts. Here is an example of how to use these exercises within your routine and as a workout on their own. Workout your Core and Abs between 2 to 3 times a week. Add this to the end of your regular workout routine. Circuit training is when you complete one exercise then proceed to the next exercise. Stay tuned for more Core and Abs exercises videos. The May / June issue of Maximum Fitness is exploding with tips and workouts to get you back into shape for the beach or whatever you need to look good for. The 3000 Abs Workouts by itself makes it worth going out to get a issue. workout that will keep your stomach muscles confused and burning. Obliques. Select only 1 Core exercise. Workout two to three times a week. guessing and burning by hitting them at different angles. Avoid this workout on days you work back and legs. Lower Abs, Upper Abs and Obliques. Choose one exercise perform for 1 set – 1 minute, work up to 3 sets – a minute each. Side Plank with Dumbbell make sure that you do both sides. Hold each side for 3 – 5 seconds. Remember diet is also key when trying to get your six pack ripped and in shape. Pick up this month’s issue of Maximum Fitness for the rest of the article and advice on getting your six pack abs. 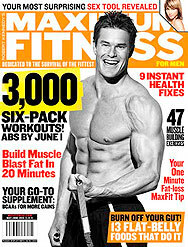 The February 2010 issue of Men’s Fitness is packed with workouts, fitness tips and no – flab foods. What got my attention was their ” MMA WORKOUT GET ABS LIKE GSP.” Any UFC fan knows that GSP ( Georges St-Pierre ) has some of the best looking abs in the UFC. I was inclined to review this workout because I want them too. I wasn’t disappointed, well may be a little but not in a bad way . More like I wish I had more time way. I gave this workout four and a half stars. It is a solid ab routine, left me with that I have been worked out feeling. The time and the commitment it takes to get the MMA abs is something I don’t have right now. I also think that a lot of readers of MF are thinking the same thing. Great workout but how do I fit it into my real life? This is my only issue with the workout, that it wouldn’t fit into my real life to get me the results that I see on the UFC fighters. There is hope, the article says up to six times a week. Maybe I can get by with twice a week. We will see.